Eight Rules for Judging… Mysterious Risk Takers? 위대한 대통령은 어떤 잣대로 평가할 수 있을까? 미국의 저명한 역사학자이자 대통령학의 권위자인 리처드 노턴 스미스씨는 도덕적 기준, 신비감, 당대의 잣대 등 8가지 기준을 제시했다. 이번 호 ‘시사영어 따라잡기’는 포브스에 실린 ‘대통령을 판단하는 8가지 기준’ 기사를 바탕으로 반복적 표현을 피해가며 좋은 글을 쓸 수 있는 방법을 제시한다. 로널드 레이건 전 미국 대통령. Barack Hussein Obama II is the 44th President of the United States of America: but how much do you know about the others? Most people know that George Washington was the first, but who was the tenth, or the twentieth? Of course those Presidents from the late Twentieth Century are bound to be more familiar to us because of their proximity, but what makes a good leader, and how does history judge such people? What are the criteria? How does history judge who is great and who is not? Richard Norton Smith of George Mason Universitya , a renowned historian and a scholar of U.S. presidents, said this at the 13th Annual Wharton Leadership Conferenceb. He suggested eight rules for a more objective assessment of the chief executive, saying opinions of the commander-in-chief “bounce around like corn in a popper”. Smith′s eight rules for judging a president were posted on Forbes.comc. ① A leadership style of doing nothing is more problematic: Think Thomas Jefferson, who purchased the Louisiana territory in 1803 from France; Lyndon B. Johnson, who passed the Civil Rights Act of 1964; Harry Truman, who stopped communist aggression in Korea; and Richard Nixon, who began dialogue with China. They were risk takers while in office but history rated them highly. The most difficult leadership decision could be to do nothing, however. George H.W. Bush snubbed the historic moment of the collapse of the Berlin Wall in 1989d to avoid angering Russia. ② A president′s power comes from moral authority: Franklin Roosevelt built emotional credibility as he encouraged Americans to overcome the Great Depression in his radio speechese. Ronald Reagan survived an assassination attempt and underwent surgery in 1981f. He reassured Americans when he jokingly said, “Honey, I forgot to duck”. 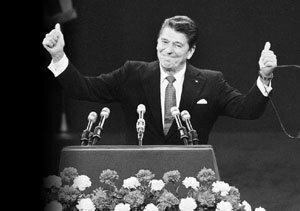 ③ A great president has a “great enemy”: Franklin Roosevelt had Benito Mussolini of Italy and Adolf Hitler of Germany, while Reagan had what he called the “evil empire” in the Soviet Union. These fights against their enemies made people believe they were proud warriors defending their people′s freedom. ⑤ Popularity is not legacy: The beloved Warren G. Harding turned into one of the most maligned U.S. presidents after scandals broke out after his deathg. Criticism increased and newly discovered facts showed that he lacked ability in the course of becoming president and lacked quality as president. Harding, however, won his battles and helped bring stability after World War Ｉ. ⑥ Don′t judge a president by today′s standards: Modern scholars undervalue Andrew Jackson, who expanded voting rights from certain white people with land to all white people, but say he paid little attention to women and blacks. For a correct assessment of a president, the thoughts of the people and conventions of the times should be considered. ⑦ Accepting “unintended consequences”: Woodrow Wilson wanted to become the father of a “new freedom” emphasizing smaller national government, but failed in the wake of World War I. His vision was overtaken by unexpected events. ⑧ Even a weak president has a legacy: History generally is kind to strong presidents. Yet Calvin Coolidge, who was considered indecisive, should be reassessed in that he protected taxpayers and refrained from expanding the government.